A book club for children in grades 4 to 6. Read the book at home and come to the Library for bagels and fun book discussion. 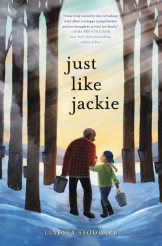 This month's book is "Just Like Jackie" by Lindsey Stoddard. Books are provided as a generous gift from the Hornac Endowment Fund. Registration required.